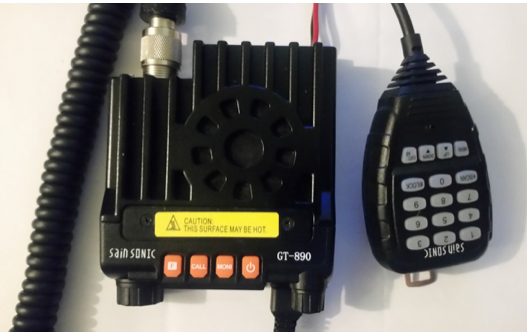 Many of you will be aware of or own the cheap Chinese “20W” VHF/UHF radios that are sold under various names (QYT8900, KT8900 or GT-890). I have a Sain Sonic branded radio of this type. 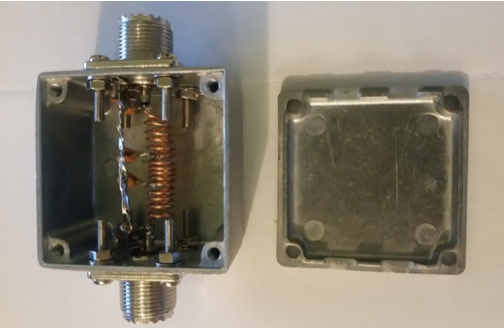 In looking at reviews I found that they typically have 2nd and 3rd harmonic levels that do not comply with the regulations when operating on the 2m band. The conclusion in the article was that they have only one low pass filter that cuts off above the 70cm band. I have since found the circuit diagram for the radio and there are in fact two sets of filters: a band pass for Rx and low pass for Tx for each of VHF and UHF. 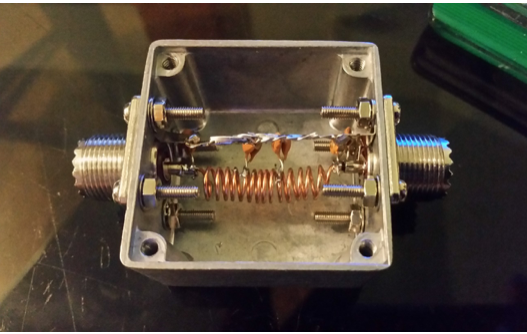 So that I can reduce the harmonics to an appropriate level I designed a simple filter to cut off above 150MHz that I could use when operating on 2m. A quick check online found a filter design site into which I typed the required parameters and got the results. Another site for inductor calculation gave me the number of turns and length for the inductors – I selected 6mm diameter for physical stability. The results are in the table below. For the physical construction I chose a small 50*50mm metal box, a pair of SO239 sockets, 0.5mm enamelled copper wire and 50V ceramic capacitors from my favourite electronics supplier. The holes for the SO239 sockets need to be about 14.5mm diameter which was a slight challenge as my drill set and drill only go up to 13mm. A friend with a 9/16” reduced shank drill bit came to the rescue. As always be sure to clamp the box securely when drilling and start with a small drill (I started with 2.5mm) and work up. This allows more accurate positioning of the holes and reduces the amount of material removed and heat produced with each cut. Once I had the big holes done I started on the mounting holes. 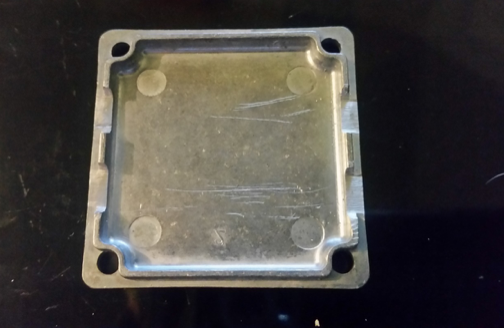 The holes in the SO239 sockets are 3.5mm diameter and I used a drill of that size to start each hole to make sure the hole in the box lined up with the hole in the socket. I did one hole for each socket then secured the socket with a 3mm screw and nut before doing the other 3 holes. I had originally thought to tap the holes in the box to avoid having to fiddle with washers and nuts in the bottom of the box, but all my attempts to do so resulted with a 3mm hole with no thread. I may not be very good with the tap but if I failed so often it didn’t seem like a good alternative for reproduction by others. It turns out I was trying to use a damaged tap – still only a turn or two in aluminium doesn’t strike me as a great mounting strategy. As can be seen from the table each of the coils are 5 turns making a total of 15 turns over a total of just over 30mm. The space between the centre contacts of the sockets is very close to this dimension so I just wound the coil on a 6mm drill bit, trimmed and removed the enamel from the ends and along the side of the coil where the terminations of the coil are (see picture) and stretched it out to fit between the sockets. Next the capacitors were added. To get 44.49pF I used 2 * 22pF in parallel and to get 25.07pF I used a 22pF and 2.7pF in parallel. I twisted the legs of the paralleled capacitors together and trimmed the side connecting to the coil as short as reasonably possible. The other end I left long and used them to connect to solder lugs under one of the screws at each end, folding the excess towards the centre to connect the other capacitors and the other side. The length of the coils was set by giving the centre 5 turns a bit of a squeeze thus reducing its length and increasing the length of each outer coil – there is only 1/2mm in it. The last issue was to fit the lid. With the close fitting of the sockets a small portion of the lip on the lid needed to be removed so that the lid would sit correctly. A trip to the Club to check on the performance confirmed that the filter was performing as expected according to the spectrum and antenna analysers we used with cut-off starting at about 160MHz due to using slightly smaller capacitors than were called for in the design. Excellent article thanks Gary, Regards Ed.